We’re excited to be at Dovetail Studios, 2853 W. Montrose Ave. Chicago. Il. Tickets on sale NOW! Discover the hidden dramas of people and situations in a world created by Lin Shook and Perceptual Motion, Inc. We are surrounded by dramas, most of which we are unaware, until something happens to link the bits and pieces together. It’s all a Matter of Perception. See two premieres choreographed by Artistic Director Lin Shook and the sassy “Ms. Goddess Goes to Tea by Guest Choreographer Peggy Lamb. The winning idea of PMI’s Your Ideas in Motion contest, When the Stars Dance, will premiere. Dancers are aged 24 to 85. This program is partially supported by a grant from the Illinois Arts Council Agency and many generous individuals. Contributions to Perceptual Motion, Inc. are tax deductible and go to the very worthy cause of making the healing, empowering and joy of dance available to people of all ages. In addition to our concerts for the general public-that often include talented out of town artists- we also produce dance events like Dancing in the Square, The Chicago Line and Classes and Workshops that engage the community. We’re small, but we deliver big benefits. Your contributions keep us going. There are many Ways to contribute to Perceptual Motion, Inc.
1) Make a donation on-line. A donation of $50 or more will really help us reach our goals. If you donate $100 or more, you’ll receive 2 free tickets to attend our new initiative: an exclusive “Meet the Artists” event, with a look at a new work, discussion of and hands on experiences in the choreographic process, informal talks with company members and refreshments. 3) Make a monthly donation of $10 or $15. Will you really miss the Starbucks? Small monthly amounts can make a big difference to us! Contact us by email: pmidance@gmail.com or phone: 773-549-3958 to arrange. 4) Volunteer your time. Do you have expertise in social media, marketing, or fundraising? Or something to donate for a raffle or silent auction? Or maybe you’ve got some time to help out at an event? We are always looking for volunteers! Contact us by email: pmidance@gmail.com or phone: 773-549-3958. All contributions to Perceptual Motion, Inc. are tax deductible. “Having children in Into the Silence was absolutely brilliant! “It was inspiring and heartwarming to see such a wide range of ages performing together. Perceptual Motion is a multi-generational modern dance company comprised of dynamic and accomplished dancers in Chicago, Illinois. We dance with passion, grace, and a commitment to bringing the joy of dance into people’s lives. 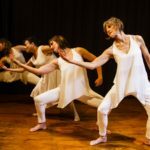 Perceptual Motion dancers bring a wealth of expressive wisdom from their diverse life experiences. PMI’s (Perceptual Motion Inc.) programming explores and celebrates the powerful impact of dance in our lives. In 2006, the National Center for Creative Aging honored Perceptual Motion as one of six organizations nationwide named Selected Best Practices in Dance for Older People. Perceptual Motion, Inc. engages dancers of mixed generations to create inspiring images and meaningful artistic experiences that open awareness, challenge perceptions, and create community. The spectrum of ages and movement ability creates an inspiring dichotomy — one that’s very robust yet calming; ethereal and real.